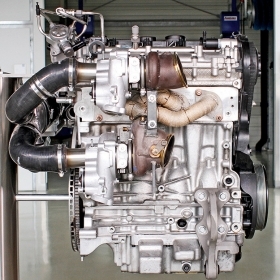 Volvo Car Group is testing a 2.0-liter four-cylinder engine that uses three turbochargers to crank out at least 450 hp. Volvo calls its "triple boost" engine a concept and has not said if the powerplant will go into production. But if it does, its rating of 225 hp per liter would be one of the highest ever for a regular production vehicle's engine. The 450-hp engine far eclipses the power output per liter of such supercars as the Bugatti Veyron, whose 8.0-liter engine makes 1,200 hp, or 150 per liter. The concept engine is part of Volvo's new Drive-E engine family, the first new engines designed and built by Volvo since the company's split from Ford Motor Co. in 2010. Volvo's new 2.0-liter engine is rated at 225 hp per liter, more power per liter than some supercars. The triple boost engine would be expensive. To get such high output from such a small engine, Volvo engineers developed a boosting system that uses three turbochargers -- none of which is powered by exhaust gases, as today's turbos are. Here's how it works: Two turbochargers connected to the engine's intake system are powered by an electric turbocharger. Volvo says the compressed air from the electrical turbo quickly spools up the two other turbochargers and eliminates turbo lag, or the slight hesitation usually felt when a turbocharger fed by exhaust gases is winding up. Mattias Evensson, race engine director at Volvo Polestar Racing, which helped develop the technology, said, "This was a very exciting project as we pioneered a combination of technologies in the same application, and the result is a quite unique engine with its high power, yet quick response."